At Calabash Cove each of the charming accommodations are all beautifully appointed, making use of natural materials wherever possible, and offer unparalleled views across the Caribbean sea, of the capital Castries to the South, and nearby Martinique to the North, from the privacy of your porch or balcony. Our 1,000-square-foot Waters Edge Cottages, handcrafted hideaways on the edge of Mosaic beach, feature private plunge pools, outdoor rain showers and hammocks, while our unique Swim-Up Jr. Suites offer private access to the resort's stunning infinity-edge pool directly from your patio. Also available are luxurious Sunset Oceanview Jr. Suites with oversized Jacuzzis and spectacular views across the bay. The Leisure Concierge at Calabash Cove offers a number of individualy tailored excursions, specifically designed to enable you to experience the best that St. Lucia has to offer. Sail the high seas with one of St. Lucia's most charismatic storytellers, or treat yourselves to a romantic champagne picnic in the heart of our unspoiled countryside. Take an exhilarating hike to the top of our majestic Pitons and witness unrivalled views across the island and north to Martinique, or indulge in the same breathtaking vistas from the comfort of your helicopter. 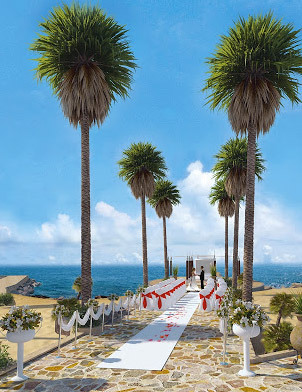 The options mentioned here represent a small selection of what is on offer whether you seek romance or adventure your dreams can become reality. These 9 beautiful mahogany decorated cottages are the best get away locations available. Watch the waves come into the beach from the privacy of your own plunge pool or have a romantic night in together with some and watch the sunset for the perfect end to every evening of your honeymoon.